Ht / Wt: 6'1" / 214 lb. 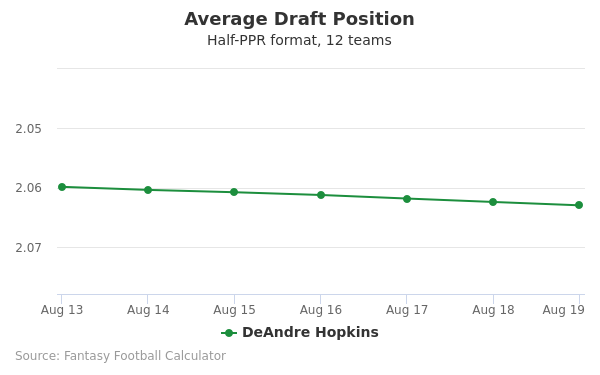 DeAndre Hopkins's fantasy value is measured by his average draft position (ADP) in fantasy football mock drafts. 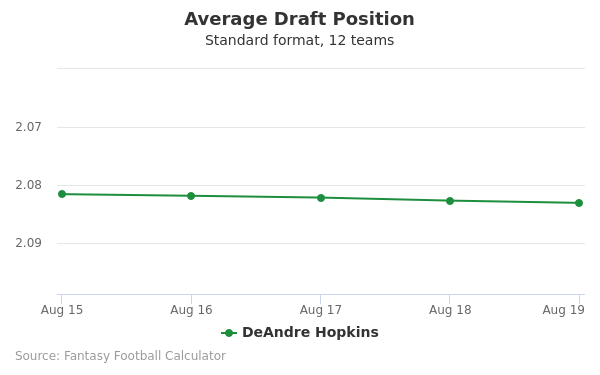 In recent drafts, Hopkins's current ADP is 1.07, which indicates that his fantasy outlook is to be the 7th pick of the 1st round, and 7th selection overall. 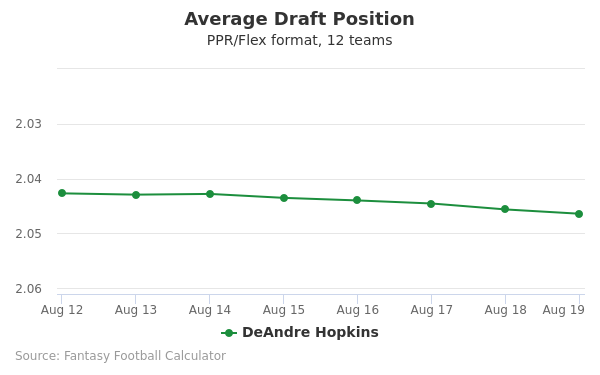 The code below will display a graph that updates every day to show the ADP data for DeAndre Hopkins for the past 30 days in 12-team PPR leagues. Draft DeAndre Hopkins or James Conner? Draft Davante Adams or DeAndre Hopkins? Draft David Johnson or DeAndre Hopkins? Draft DeAndre Hopkins or Julio Jones? Draft DeAndre Hopkins or Michael Thomas? Draft DeAndre Hopkins or Joe Mixon? Draft DeAndre Hopkins or Odell Beckham Jr? Draft DeAndre Hopkins or Tyreek Hill? Draft Dalvin Cook or DeAndre Hopkins? Draft DeAndre Hopkins or Travis Kelce? Draft DeAndre Hopkins or JuJu Smith-Schuster? Draft Antonio Brown or DeAndre Hopkins? Draft DeAndre Hopkins or Nick Chubb? Draft DeAndre Hopkins or Pat Mahomes? Draft DeAndre Hopkins or Mike Evans? Draft DeAndre Hopkins or Marlon Mack? Draft DeAndre Hopkins or Zach Ertz? Draft Damien Williams or DeAndre Hopkins? Draft DeAndre Hopkins or T.Y. Hilton? Draft DeAndre Hopkins or Leonard Fournette? Draft Adam Thielen or DeAndre Hopkins? Draft DeAndre Hopkins or Sony Michel? Draft A.J. Green or DeAndre Hopkins? Draft DeAndre Hopkins or Keenan Allen? Draft DeAndre Hopkins or George Kittle? Start Antonio Brown or DeAndre Hopkins? Start DeAndre Hopkins or Pat Mahomes? Start DeAndre Hopkins or Mike Evans? Start DeAndre Hopkins or Marlon Mack? Start DeAndre Hopkins or Zach Ertz? Start Damien Williams or DeAndre Hopkins? Start DeAndre Hopkins or T.Y. Hilton? Start DeAndre Hopkins or Leonard Fournette? Start Adam Thielen or DeAndre Hopkins? Start DeAndre Hopkins or Sony Michel? Start A.J. Green or DeAndre Hopkins? Start DeAndre Hopkins or Keenan Allen? Start DeAndre Hopkins or George Kittle? DeAndre Hopkins was born June 6th, 1992. His love for football started at a very young age in which he would attend D. W. High School. The South Carolina high school would be where DeAndre would push himself as an athlete. DeAndre would compete in basketball, track, and of course football. While playing high school football Hopkins would receive 57 receptions and score a total of 18 touchdowns. His amazing defensive skills landed him an amazing 28 interceptions and an incredible five defensive touchdowns. During his senior year playing football in high school Hopkins would be named the Independent Mail's player of 2010. Clemson University would be the college in which DeAndre Hopkins would attend. From 2010-2010, while attending the college Hopkins would play for the Clemson Tigers, the college's football team. It was during his play with the team that Clemson would impress through becoming the team's number one receiver. Hopkins would obtain 637 yards through 52 astounding receptions as a freshman. His total career at Clemson would prove to be one of the best with over 1,405 yards. With an opportunity to join the NFL draft present, Hopkins opted out of his final senior season with the team. Chosen during the 2013 draft Hopkins was the 27th choice during the first round of the draft. This was a huge choice for the Texans as it was only the second time that they would choose an offensive player in the previous ten years. The NFL draft proved extremely successful for both Hopkins and the Texans as a rookie and combine his skills to become a record setting player.. Hopkins 40 time was an astonishing 4.41with a vertical jump of 36 inches. His draft performance impressed and made him a superb option for teams seeking a highly athletic player. Hopkins eventually would sign a $7.62 million contract with the Texans. The 2015 NFL season was one of Hopkins strongest. Hopkins's first game of the season saw him obtaining 9 passes and scoring two touchdowns. Hopkins would also score his first 100-yard game later on during the 2015 season. Perhaps the best part of the 2015 season came when Hopkins broke the all time record of touchdowns received in a season for the Texans. This achievement ranks as one of DeAndre Hopkins's best accomplishments of all time. Hopkins 2015 performance ranks as one of the all time best for the Texans. With over 1,521 yards and 11 touchdowns Hopkins performance earned him an All-Pro and a Pro Bowl pick. To see some of Hopkins's best highlights click here. 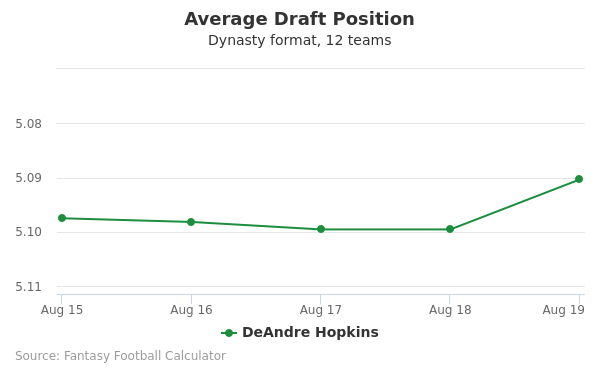 2016 saw Hopkins making a move to improve his contract. Through avoiding showing up to his training camp, Hopkins made a play to hold out for a new contract. Later in the season more problems arouse for Hopkins as he would be faced with a fine of over six thousdand dollars. Hopkins would end up finishing the 2016 football season with much lower stats than 2015. Hopkins has personally been associated with wearing and supporting the Kanye West line of shoes. His support of West's products came to penalize him when he was ordered to pay a fine for wearing West's cleats. On his twitter @Nukdabomb DeAndre Hopkins continues to be a highly outspoken player who enjoys talking to fans and communicating his thoughts. Twitter has allowed players like Hopkins to adequately discuss how they feel about each game while also being able to connect further to fans. Hopkins's mother Sabrina Greenlee continues to be a very essential part of DeAndre's life. Having grown up in a very impoverished area of South Carolina, Hopkins has a high value on the importance of a strong family. Hopkins father had passed away when he was young thus leaving Hopkins to garner a close relationship with his mom Sabrina. To this day the two are inseparable and Sabrina attends many of DeAndre's games. DeAndre Hopkins is currently serving a four year, $7,626,702 salary with the Texans. His time with the Texans has continued to prove a huge success throughout his 2015 and 2016 seasons. Fans who are eager to purchase one of DeAndre Hopkin's jerseys can do so here.